Eyelash Extensions are individual lashes made of Synthetic fiber polyester, that are applied to your own natural lash. It will make your eyelashes look fuller, longer and fabulous. These extensions come in different sizes and thickness. No matter what length or thickness you choose it will make you look fabulous and outstanding. Eyelash Extensions are semi-permanent eyelash extensions comprised of individual synthetic eyelashes that are curved to replicate a natural eyelash. Our lashes are thicker at the base and taper to a fine point. They are applied to individual eyelashes, one extension at a time, for a natural, elegant look to lengthen and add fullness to the existing lashes.Eyelash Extensions are for professional application only. Self-application and application by untrained individuals is strongly discouraged. Will Eyelash Extension damage my natural lashes and is the glue safe? 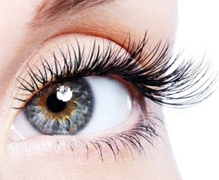 Our Eyelash Extensions are made from synthetic polyester and mink. But synthetic lashes respond better to wear and tear than other materials. In addition, synthetics have the least possible chance of allergic reactions with human skin. Semi- Permanent Eyelash Extensions add curl, thickness and length to lashes, opening up the eye for added definition. They look A-MAZING and make you look a millions times prettier. It generally takes between 1-2 1/2 hours to apply a full set of Xtreme Lashes® Eyelash Extensions. Touch-ups can be done in as little as 45 to 120 minutes. Are they like false strip eyelashes you get at the pharmacy? No, these are “individual” eyelashes that will be professionally applied to your eyelashes one on one by specialist. There will be about 40 eyelashes per eye. They are applied with a special adhesive that is both durable and safe for the eyelashes. Any damage to my natural lashes? Absolutely not, the false lashes don’t come in contact with the skin or the root of natural lashes and thus they are safe. They won’t even give any trouble with your natural growth of lashes. Do not wash eyes or shower and avoid sweat and steam for 24 hours after lash application. DO NOT use and eyelash curler on your extensions. We recommend touch-up appointments every 2 weeks, to fill in the areas where your natural lashes have fallen out and new lashes are growing in. Thank you for you business we hope you enjoy your new lashes!